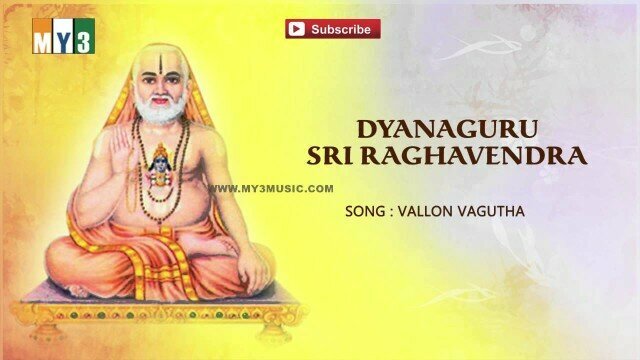 Sri Raghavendra Swamigalu born Venkanna Bhatta, was a renowned Hindu saint, philosopher and proponent of Dvaita philosophy proposed by Sri Madhvacharya. He served as the head of the matha in Kumbakonam from 1621 to 1671. His Brindavan in Mantralayam in the present-day Andhra Pradesh is an important place of pilgrimage. The numerous miracles he performed have led to him being worshipped even today as a Guru and he is believed to be the saviour for those who placed faith in him. He is the avtar of Prahlada, who is famous as one of the best bhaktas of Lord Narayana. Sri Raghavendratheertha was born as Venkatanatha in the town of Bhuvanagiri in Tamil Nadu to Kannada Brahmin parents, Thimanna Bhatta and Gopikamba, in 1595. He was also known as Venkanna Bhatta or Venkatacharya in honor of Venkateswara.